Back cover blurb: A lifetime ago, every year Caroline Shipley looked forward to her wedding anniversary. But then a celebratory trip to Mexico for the occasion with her husband and friends ended in the unsolved kidnapping of her infant daughter, Samantha. Now, fifteen years after that horrific time, divorced and isolated,Caroline is forced to relive the kidnapping by reporters who call every year on the anniversary of Samantha’s disappearance. However, this year when the phone rings, Caroline hears the sweet voice of a girl claiming to be her long-lost daughter. Plunged back into the world of heartbreak, suspicion and questions that led the case to run cold so many years ago, Caroline doesn’t know what or who to believe. But when she starts to figure it out, she finds the answers dangerously close to home. Caroline Shipley has never recovered from the disappearance of her two year old daughter. Her ten year marriage has dissolved and her relationship with her remaining daughter leaves a lot to be desired. Caroline's life has been haunted by the guilt she has had since the night of her daughters disappearance. At her husband, Hunter's insistence, they left their daughters alone whilst they went out for their tenth wedding anniversary meal, just a few floors down from their room. This scenario is going to draw obvious comparisons to Madeline McCanns disappearance, but this is an exceptional and emotional fictional novel, not a rehash of TV reports from years gone by, or conspiracy theories. Every year on the anniversary of Samantha's disappearance, Caroline's hopes are built up by press speculation that her daughter is still alive, or even worse some stranger calls, claiming to be Samantha. The fifteenth anniversary of Samantha's disappearance is no exception, but this time Caroline vows not to get caught up in the media circus. She needs to concentrate on her relationship with her other daughter, Michelle, a troubled young woman, no doubt affected by her unintentionally dysfunctional childhood. When Lili calls claiming to be Samantha, Caroline's first instinct is to slam the phone down. But there is something in Lili's tone that makes Caroline stay on the line. The young girl is obviously petrified, those around her convincing her she bears a striking resemblance to the latest photograph released of what Samantha might look like now. Not only that but she never feels like she fitted in to her own family. A typical teenager some could argue. But Lili spent a lot of time moving around when she was young, her family not allowed radio, television or internet access. Does Caroline dare to believe that Lili could be Samantha, or is this just another cruel hoax? This is the first Joy Fielding novel that I've read, but it certainly won't be the last. 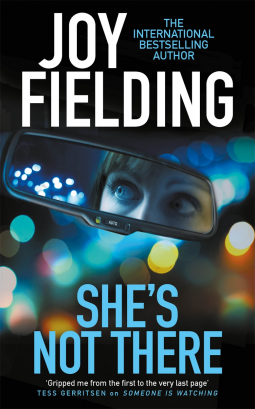 She's not there is available from 14 December 2017.